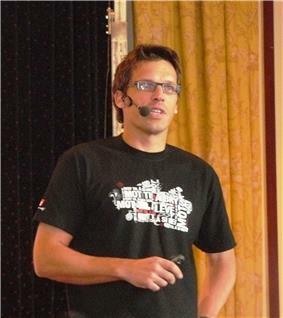 Johann Olav Koss, CM (born 29 October 1968) is a former speed skater from Norway, and current assistant coach of Norway's speed skating team. Koss is currently ranked as number 16 on the all time speed skating world cup medal table. Johann Olav Koss resides in Toronto, Canada. Koss made his Olympic debut at the 1992 Winter Olympics, finishing seventh on the 5,000 m, five days after undergoing surgery because of an inflamed pancreas. He would recover to win gold on the 1,500 m (by only 0.04 seconds over his countryman Ådne Søndrål) and silver on the 10,000 m (behind Dutch skater Bart Veldkamp ). After his speed skating career, Koss trained as a Right To Play, which uses sport and play as a tool for the development of children and youth in the most disadvantaged areas of the world. From his adopted home in Toronto, Canada, Koss directs seven regional Right To Play offices in Europe and North America with 64 paid staff and 90 volunteers. He married his second wife, Jennifer Lee, in New York on 23 May 2009. Lee's friend Chelsea Clinton was one of the bridesmaids. Lee, 37, is a Harvard College, Oxford University and Harvard Business School graduate, and a former cellist who studied at The Juilliard School. She is the granddaughter of Kim Chung Yul, the former Prime Minister of South Korea and Chief of the Korean Armed Forces during the Korean War. She is the Co-Founder of a retail business called BRIKA which sells products from under-the-radar artisans and makers. She is a former management consultant and most recently a private equity investment professional at Ontario Teachers' Private Capital in Toronto. They have three children together, Aksel, Annabelle and Andreas. Koss completed his Executive MBA at the Joseph L. Rotman School of Management in the University of Toronto in Canada. He has Honorary Doctor of Laws Degrees from Canadian universities - Brock University and University of Calgary. On 1 July 2015, Koss was made an honorary Member of the Order of Canada. ^ Issue 32Ode MagazineVisscher, Marco. "A Man With Balls"
^ 24. mai, 2009Dagbladet"-Verdens beste brud"
^ Governal General site announcing Koss' C.M.